But a special course was added to the curriculum for the year of spirituality: the acts of the Magisterium. Faithful to the teaching of Fr. 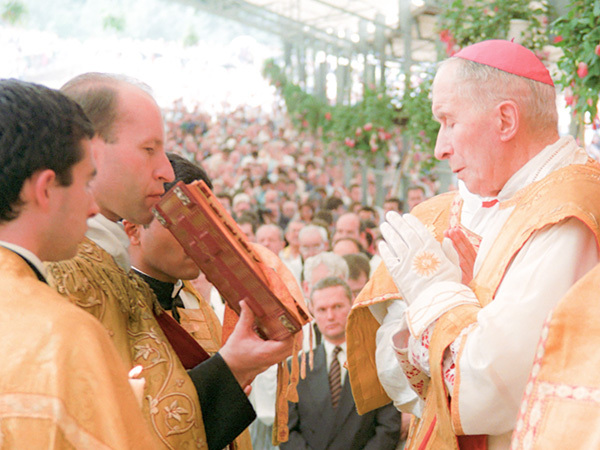 Le Floch, Archbishop Lefebvre had his seminarians study the encyclicals of the popes on Freemasonry, Liberalism, Modernism and Communism. That way they could make the same discovery that he did when he was at seminary in Rome. They discovered the popes’ judgments on liberalism, the secular State and modernity. Even though the course featured anti-liberal authors—Louis Veuillot, Cardinal Pie, Bishop Freppel, etc. —the principal teachers were the popes: Gregory XVI, Pius IX, Leo XIII, and St. Pius X. The students attentively read the arguments of Pope Pius XI in his encyclical Quas primas on the social reign of Christ the King. The motto of St. Pius X, “To restore all things in Christ” was the fundamental axis of this course on the Magisterium of the Roman Pontiffs. Modern ecumenism is contradicted by Satis cognitum by Leo XIII: there is no other ark of salvation than the Catholic Church. Collegiality is opposed to the doctrine of the First Vatican Council: Christ gave supreme authority over the pastors and the sheep to Peter alone and to his successors. The Society relies on 2,000 years of tradition of the Church. "I have been reading Humani generis over the past few days, which Pope Pius XII wrote in 1950. That encyclical is none other than the condemnation of everything which has been put in place since the Council. It is impossible to accept what has happened since the Council and at the same time accept that Pope Pius XII was right in his encyclical Humani generis."